The Rexel RLWM26 Wide Entry Micro-Cut Shredder is ideal if you have a requirement to shred A3 sheets as well as standard A4 (up to 25 sheets of 80gsm paper at a time). It will also shred computer listing paper. 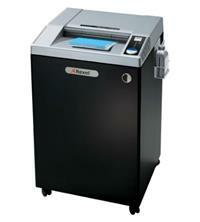 The shredder has a P-5 security rating, so will shred documents into very small particles measuring 1.9 x 15mm (e.g. an A4 sheet will be shredded into approximately 2000 pieces). The RLWM26 shredder features a very large 175 litre removable plastic bin, but has a higher 225 litre capacity if you were to use plastic bags instead. In addition to paper, it will also shred staples, paperclips, credit cards and CDs. Other features include: a jam-free function which automatically reverses paper out of the shredder when a jam is detected; auto cut-out when the bin is full or door is opened; auto oiling to keep the shredder working optimally; easy to use controls; castors for easy mobility; and quiet operation. Warranty is 2 years on the machine and 20 years on the cutters. So if you have a requirement for a wide entry shredder (405mm entry width), suitable for large office use, and you also want to shred highly confidential and secret documents, then consider the Rexel RLWM26 Micro-Cut Shredder. 5What is a Micro-Cut Shredder?